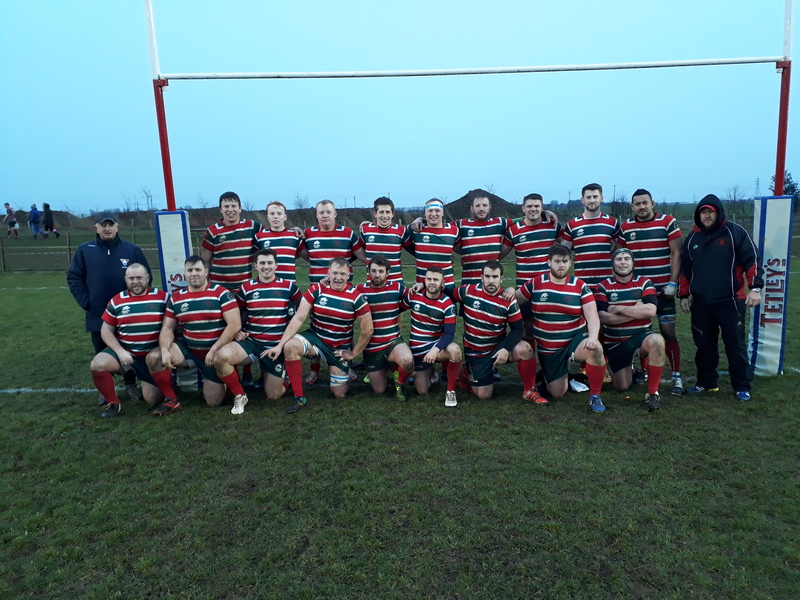 Lincoln’s 1st XV battled hard after a first-half red card but were unable to prevent a narrow 7-0 defeat against local rivals Market Rasen & Louth in their final league game of the season. The hosts showed great grit and determination throughout the match, but what could have been a thrilling spectacle suddenly became an uphill battle late in the first half. The referee later confirmed that he gave a yellow card to the Market Rasen player (Jake McKay) for pulling back Lincoln scrum-half Mitch Ashworth, who he said was sent off for “punching”. Market Rasen started the match strongly with Tom Stephens making a good early break through the Lincoln defence. The visitors wasted the chance to open the scoring after 11 minutes when Ben Young missed a penalty. Lincoln began to grow into the game as Sean Chapman ran at the Rasen defence to put them into a great position near the 22, but unfortunately the move didn’t end with a score. Rasen flanker Jake Pryer produced an excellent performance and was a constant threat and was named man-of-the-match by Lincoln after the game. Lincoln captain Leigh Dearden was sent to the sin bin against the club where he had spent most of his rugby career. The referee said the yellow card was shown for “stamping”. The game’s turning point happened shortly before half-time when Ashworth was sent off and Lincoln knew the second half would be an even tougher battle. To their credit Lincoln refused to give up and made a positive strong start to the second half despite being a man down. Matt Walker made some good yards before Ben Sykes, who was named as Lincoln’s man-of-match with Will Scammell, powered through and was tackled just metres short of the try line. Chapman then dodged past a Rasen defender before being tackled just short of the try-line. Chapman was forced off injured soon after with young centre Jack Miles coming on in his place. Lewis Wilson and Scammell both made good breaks through the Rasen defence, but ultimately a combination of good play by Rasen and being a man down proved decisive. Rasen put a lot of pressure on Lincoln in the second half, but the hosts’ defence held firm and valiantly kept them out until the hour mark. A good strong drive from a line-out set up the match-winning try for Rasen’s captain Ben Chamberlain. Tom Alldridge successfully slotted over the conversion. Lincoln tried to find a way back into the game with Wilson making good yards through the Rasen defence, but the passing move was ended by a knock-on soon after. Scammell ran at the defence in the closing minutes before Rasen once again stopped Lincoln just short of the try line to hold on for victory. The result sees Lincoln stay sixth in Midlands Two East (North) and ahead of Market Rasen by just a point. However, Rasen still have another league game left against bottom club Ashby. Lincoln’s league season is over but they still have a cup final to look forward to against Stamford on Monday, May 6. Lincoln captain Leigh Dearden spent around 14 years in the Market Rasen first team and was part of the side that previously took them into Midlands One East. The forward was proud of the grit and determination shown by his side in the local derby clash against his former club at Longdales Park. “It was a marginally disappointing day at the office for Lincoln with the score at 7-0,” said Dearden. “Two great squads of players came to play a good brand of rugby and both teams wanted to deliver a spectacle befitting of such a good crowd turnout. “What I found far more disappointing was that sadly the game was brought down in standard and spectacle. It was reduced to essentially 80 minutes of scrummaging and that part I find far more disappointing. “I know all my players at Lincoln and my friends and fellow rugby players at Rasen would have much rather enjoyed playing a better spectacle and a better brand. “I know that everyone was excited for this match, this occasion, hence such a good crowd turnout and I know both teams were genuinely looking forward to it. “So what I find far more disappointing is what the game was sadly condensed down to so apologies for those that came to watch for the lack of spectacle. But that aside, as always a fantastic day to be Lincoln and hats off to our visitors Market Rasen. “Following the match everything was conducted in the right manor. We showed them fabulous hospitality and in turn they made for a wonderful post-match evening and it was a genuine pleasure to see so many friends and fellow rugby players enjoying one another’s company and taking one another’s presence in the right spirit, a thoroughly enjoyable evening. We look forward to playing them again. Rasen captain Ben Chamberlain said: “It was a great local derby played in the right manner. The boys did me and the club proud.